Creeping Juniper is a low maintenance, spreading, ground cover shrub capable of growing in some of the worst soil and rocky conditions. You will love this shrubs' pleasant fragrance and year-round color. A beautiful accent or foundation plant, Creeping Juniper has scaly foliage and is commonly used by landscapers to add texture under trees or flower beds. 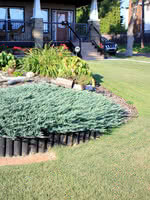 Consider planting Creeping Juniper in areas where grass is difficult to mow or maintain.